A delicious and healthy lunchtime wrap. In a small bowl toss the tomatoes with 1 Tbs. of the lime juice, about 1-1/2 Tbs. of the parsley, and a generous pinch of salt. Set aside. Add the chipotle, adobo sauce, and cumin. Stir to blend into the oil, and then add the beans and 2 Tbs. water to the pan, stirring to blend. Simmer until warmed through, about 2 minutes. Reduce heat to low. Mash about half of the beans with a fork. Working with one tortilla at time, spread about 1/4 of the beans along the bottom third of a tortilla. Top with 1/4 of the spinach, and sprinkle with about 1/4 of the tomatoes and pepitas (if using). If you like, add a little lime juice and sour cream on top. 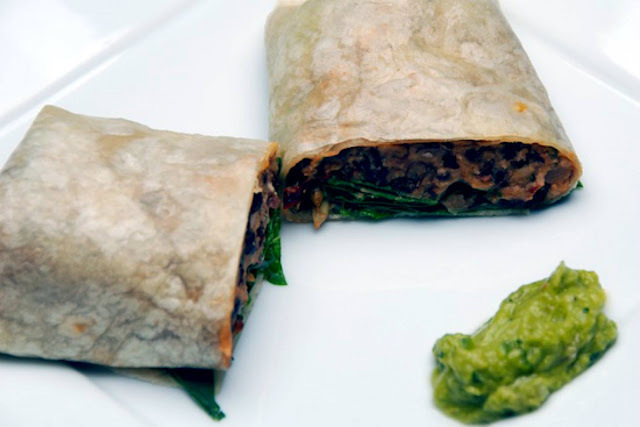 Fold the bottom edge over the filling, fold in the sides, and roll up the burrito.